For the first time since Pat Summitt stalked the sidelines, an SEC program has run the table throughout the regular-season conference slate, with Mississippi State completing its 16-0 run Sunday evening. The team’s final victory came in the form of an 85-63 stomping of Kentucky. The Wildcats posted their first losing conference record since 2008 this year, but the program has given the Bulldogs a great deal of trouble over the past few seasons, winning both games the teams have played since 2015. On Sunday, though, Kentucky could do little to slow Mississippi State’s march to an undefeated season—Teaira McCowan and Victoria Vivians combined for 38 points and 30 rebounds, helping the Bulldogs outscore Kentucky in the paint by 18 points and nearly doubling their efforts on the glass, 40-23. It capped a remarkable conference season and added to the team’s broader body of work but last night’s rout was hardly exceptional for this Mississippi State team. This is kind of a nice way of saying that they’ve been kicking everyone’s assess all year long. The Bulldogs’ average margin of victory sits at 28.0 points after last night; they outshoot their opponents from the 3-point line by a full 10 percent; they force 19.9 turnovers a game and triple their opponents in turning those turnovers into points. They’re really damn good, in short, and better than they’ve ever been in program history. That’s largely thanks to the recruiting efforts of head coach Vic Schaefer and his assistants, as well as the patience of the program’s current batch of stars. McCowan was the 2017 SEC Sixth Woman of the Year, but after two years of coming off the bench she has fully arrived as the centerpiece for this Bulldogs team and next year’s. In her first year as a starter, the 6-foot-7 junior is among the nation’s top centers (I hear you, Kalani Brown fans); she’s second on the team and fourth in the SEC in scoring at 18.7 points per game. On both ends of the court, she looks like an even more athletic version of Duke legend Elizabeth Williams, which is honestly kind of a scary thing to consider. Just one year after she played 19.7 minutes a night and was good for 8.7 points, here is McCowan posting a damn 35-18-9 line against a top-10 team. And while her offensive game has blossomed this year, let’s not forget why she’s had a spot in Schaefer’s rotation for three years running now—the woman can absolutely murder a basketball. The team has leaned on folk hero Morgan William to run the offense. Everyone knows her for The Shot that ended UConn’s historic winning streak, but the 5-foot-5 dynamo actually does her best work distributing the basketball, as she sits second in the SEC in assists behind South Carolina’s Tyasha Harris. With all due respect to Harris, William is her clear superior in running an efficient attack—her assist-to-turnover margin sits at 4.2 to Harris’s 2.8, as William has turned the ball over just 33 times in 30 games. Joining William in the starting backcourt is Vivians, a redshirt senior and Naismith Award finalist that handles the bulk of the scoring among the team’s guards. The 6-foot-1 wing leads the team and ranks third in the conference at 19.7 points. She does a little bit of everything—she punishes smaller two-guards with her big frame and blows past lumbering forwards with her quickness, and still manages to pop mid-range pull-ups and long-range bombs efficiently. Even at 39.8 percent from behind the arc, she still lands behind sharp-shooting teammates Blair Schaefer and Roshunda Johnson in made treys. For head coach Vic Schaefer, Sunday’s effort, and this season in general, is exactly the kind you want to post before you head into tournament season, when a single slip can mean a brutal and sudden end. Nobody around the team, including Schaefer, will say that they focused on the big ole zero sitting at the end of their conference and overall records, but it’s difficult to ignore a record that puts you in the company of the 1990s Tennessee program. 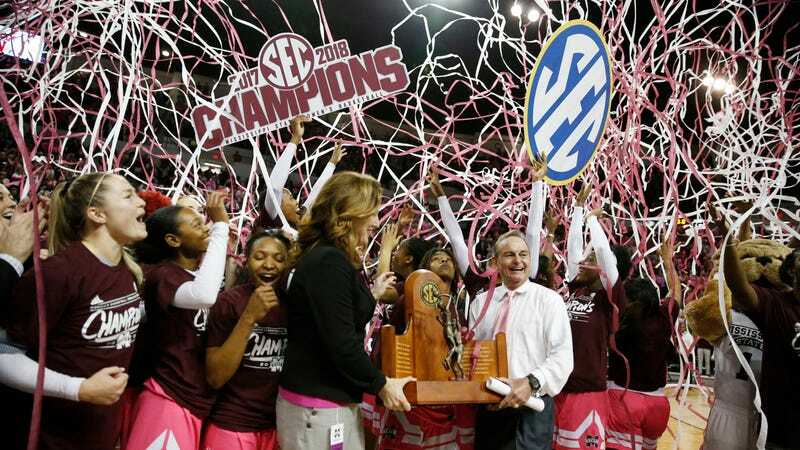 In retrospect, Mississippi State’s now-realized campaign to shoulder and elbow and otherwise make a spot for itself among the elite of women’s college basketball seems to have been ordained the moment Schaefer signed on the dotted line in 2012. The frightening part, if you’re an SEC team, is how this is so clearly not just a one-off; the plan was always to build a great program, not just a great team. It’s happening. In his first head coaching gig at Sam Houston State, Schaefer inherited a new Division I program that was struggling to survive in its new climate with an NAIA-sized budget. Per the Clarion Ledger’s profile of him from last year’s tournament, in Schaefer’s first season the women’s basketball program’s budget was $36,000 in total—hotels and gas or airfare for team travel, reimbursements for recruiting expenses, food, it all fell under one tiny umbrella. Unsurprisingly, it took five seasons for Schaefer to post a winning record there; the year after that, he was gone, where he was a defensive mastermind-in-residence at Arkansas and Texas A&M for 15 years. In 2012, after he hand-crafted the defense that earned the Aggies the 2011 national title, Mississippi State came knocking. Since hiring Schaefer, Mississippi State has steadily improved season-to-season, both on the court and in terms of recruiting. The freshmen Schaefer recruited in his second and third seasons picked up some much-needed postseason experience, and while new recruits boosted the team’s overall talent level the Bulldogs are run by their vets. On this 30-0 team, the top-three leading scorers (Vivians, McCowan, and Roshunda Johnson) are in their third, fourth, and fifth seasons with the Bulldogs, respectively. And all of them had to earn their spot on the floor; McCowan went on record as saying one of the reasons she signed with Mississippi State was because Schaefer told her up front he wouldn’t start her as a freshman. Over the past three seasons, as these players have come to recognize the minuscule differences that separate them from UConn, Notre Dame, and South Carolina, they’ve consistently closed the gap—in 2015, they were bounced from March Madness in the second round; in 2016, they lasted to the Sweet Sixteen; last season, after Morgan William stunned the nation, they lost to the Gamecocks by 12 in the national championship game. This season, on Feb. 5, the Bulldogs returned the favor, running South Carolina out of Starkville with a decisive 67-53 win. Sustained success means a lot in college basketball, right up until it means nothing at all. Mississippi State proved this last year when it edged out a Huskies program that was going for its 112th consecutive win. Right now, Mississippi State is still in the process of building towards that sort of success. Schaefer is doing his part as a recruiter and his roster is a testament to the power of his connections in the Deep South’s women’s high school game. The more successful his program becomes, the easier his recruiting job gets. String three or four of those successful 30-game seasons, and you start to see a larger movement come into focus. Whether Mississippi State can complete its undefeated run and claim a national title this season will, of course, be the barometer by which basketball fans rank their legitimacy as an elite program. But for anyone with an attention span that lasts longer than one season, it’s plain that Schaefer hasn’t just built a good 2018 team; he’s built the foundation for an elite program. Whatever comes over the next month won’t just be validation of his success in that work. It will be training for his latest batch of recruits—the ones who will take this program wherever it’s going.